Islamist militant forces have gathered strength in the Chittagong Hill Tracts (CHT) with the security forces taking no steps to tackle them, leaders of the indigenous people, opposition political parties and human rights bodies said at a discussion in the capital yesterday. In the absence of implementation of the CHT peace accord, Islamist militants of Myanmar are also helping the Bangladeshi militants by giving them arms and training , which has now posed a threat to national security, Parbatya Chattagram Jana Sanghati Samity (PCJSS) leaders said. Bangladesh Indigenous Peoples' Forum and Bangladesh Indigenous Peoples' Rights Movement jointly organised the discussion marking the eighth anniversary of the peace accord. "The separatists of Myanmar are especially helping the Bangladeshi militants in collecting arms, explosives, and providing them with training and technologies of making bombs," said a PCJSS statement. Parbatya Chattagram Sama-odhikar Andolon (Movement for equal rights in the CHT), under the shelter of security forces, is carrying out communal activities against the indigenous people in the three hill districts and conspiring for cancellation of the peace accord, the PCJSS alleged. 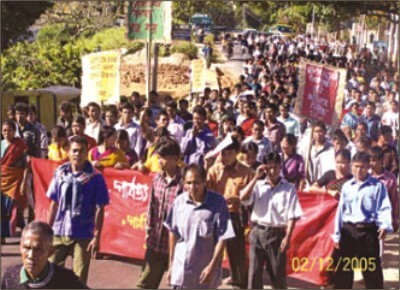 Various communal organisations are mobilising Bangalees in the CHT against indigenous people and for opposing the peace accord. Moreover, the United Peoples' Democratic Front created by a vested quarter in the government is engaged in activities against the accord, the statement added. PCJSS Vice President Rupayan Dewan alleged 'repression' on indigenous people by security forces. They are also creating obstacles to implementation of the peace pact. He regretted rehabilitating thousands of Bangalee settlers and leasing out land to them in the three hill districts. He demanded immediate implementation of the peace accord. PCJSS President Jyotirindra Bodhipriya Larma alias Shantu Larma, who chaired the discussion, stressed political will for resolving CHT problems since, he said, it is a national issue and not an issue of indigenous people only. Larma, also chairman of the CHT Regional Council, asserted said, "I have a firm belief that the peace accord will be implemented." Deputy Minister of CHT Affairs Moni Swapan Dewan admitted his failure to ensure non-implementation of the accord but declined to explain it. The CHT issue should be considered a national problem that has become a threat to independence and sovereignty of the country, he said. "No militant operations should be allowed in the CHT and its problems should be resolved through dialogue. And the policy makers of the government have a key role to play in this regard," Dewan stressed. Awami League (AL) leader Mohiuddin Khan Alamgir said if militancy gathers strength due to non-implementation of the peace accord, it must be taken up seriously. Other speakers at the discussion included Workers Party President Rashed Khan Menon, Jatiya Samajtantrik Dal President Hasanul Huq Inu, Communist Party of Bangladesh leader Ruhin Hossain Prince, justice Golam Rabbani, Dhaka University teachers Mesbah Kamal, KHS Arefin and Robayet Ferdous, Dr Abidur Reza of Bangladesh Agriculture University, women's rights leaders Shirin Aktar, Rokeya Kabir and Adibasi leader Rabindranath Saren.